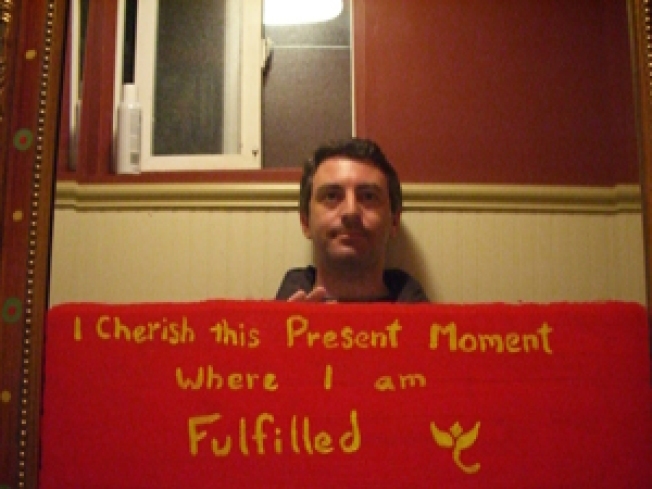 A man poses behind one of the happy signs in a Cafe Gratitude bathroom. This Thanksgiving, vegans and vegetarians don't have to feel left out. Cafe Gratitude, the cafe that wants eaters to always be thankful, is offering a free holiday meal on Thanksgiving day. And the best part of the deal is no cult initiation is required to eat, just some honest work. From 11 a.m. to 3 p.m. at its San Francisco, Berkeley, San Rafael and Healdsburg locations, Cafe Gratitude will serve you a free meal as long as you agree to help them serve others. That seems fair enough considering the cafe usually charges $6.50 for a kid's cup of almond milk.